Right now my diet archnemesis is a pesky ingredient hidden in nearly all the foods we eat—salt. Right now my diet archnemesis is a pesky ingredient hidden in nearly all the foods we eatâsalt. I've been tracking what I eat using FitDay, and the one thing I really have trouble with is sodium. The American Heart Association suggests a limit of 2,300 milligrams per day (about 1 teaspoon), but I'm averaging around 3,000 to 3,500 milligrams a day, even though I'm not a salty snack lover or heavy-handed with the salt shaker. I've always had good blood pressure, but I'm obese, black, and over 40âthree important risk factors of high blood pressure. It would be smart if I start cutting it back, ultimately to about 1,500 milligrams a day. 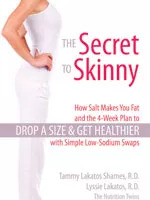 So you can see why The Secret to Skinny: How Salt Makes You Fat and the 4-Week Plan to Drop a Size and Get Healthier With Simple Low-Sodium Swaps by Lyssie Lakatos, RD, and Tammie Lakatos Shames, RD, aka the Nutrition Twins, caught my eye. Salt can make you fat? I had to ask. Q: Can you explain how salt makes us fat? Thatâs something you never hear. A: Salt does several things that contribute to packing on the pounds. First, salt causes the body to store more fat so it makes your fat cells denser. It also makes you hungrier and thirstier, which both contribute to calorie overload. Salt increases cravings and creates inflammation, which impedes oxygen flow throughout the body and makes it more difficult for fat-burning oxygen to blast fat from your fat stores. Ultimately, this impairs your metabolism. Q: You write that âless sodiumâ or âreduced sodiumâ really doesnât mean much. What else should we look out for? A: Most importantly, start reading the nutrition label (or use the lists of foods in our Jumpstart Plan to help you) and pay attention to the amount of sodium in the foods and condiments that you buy. Even take a close look at foods that are known for being âhealthy.â These may be good for you in terms of being whole grain and nutrient dense, but they may be high in salt. If you donât read labels, you may assume that your whole-grain bread or your chicken breast meat is low in sodium when these products can be quite sodium dense. Also, donât rely on your taste buds to tell you how much salt is in a food. Foods like cottage cheese may not taste particularly salty but a serving of cottage cheese has two and a half times the salt that a serving of salted nuts has! Thatâs because the salt is on the surface of the nuts. Q: This plan sounds like it would put a chip lover into a deep depression. Are there ways to cut salt and still enjoy savory snacks? A: The good news is that when it comes to chips, brands like Frito-Lay are making chips that put the sodium on the surface rather than baking it into the chip. It may taste saltier than other foods, but surprisingly, a serving of Frito-Lay snack chips contains about the same amount of sodium as a slice of white bread. So, if you stick to a serving, it can help to keep the salt from getting too high. You can still choose savory foods, but turn them into low-sodium options. For instance, if you love popcorn, choose the unsalted variety and add a teaspoon or two of grated Parmesan cheese, or add spices like paprika or cinnamon. Nuts, like chips, have salt on the surface, so they should contain less salt than you think. Choose the brands that keep the salt to a minimum. But better yet, buy unsalted nuts and season with spices like the spice blend below (we have more in our book), or try paprika or cayenne. The other great news is that portion control can help any food to meet the sodium guidelines. Even if the salt is outrageously high in a food, if you make the portion small enough, you can keep the sodium much lower. Q: A lot of women experience bloatingâyou call it a âsalt hangover.â What's the cure? A: Try the Nutrition Twins Tea and Melon Cure. Drink 2 cups of tea (peppermint, ginger, chamomile, and/or fennel teaâall digestive enhancers) and eat 1 cup of cubed cantaloupe, 1 cup of melon, or 1 cup of watermelon. Q: Can you give us a few other tips for cutting salt? A: Snack on unsalted pistachios. Snacks usually add a lot of salt, but these truly are the skinny nut. They're high in protein, fiber, and healthy fat, which makes them satiating, their shells make you mindful of what youâre eating, and you can eat 30 of them for 100 calories! Go low-sodium. If you are accustomed to a saltier version of your favorite food, stick with the new lower-sodium version for 21 days and your taste buds will adjust. This is great encouragement for the low-sodium whole-grain bread swap. You can save 400 milligrams in two slices of bread alone, and, within weeks, your tongue wonât notice a difference but your hips and heart will! Use 1 teaspoon for each pound of lean protein. Add Â½ teaspoon for each 2 quarts of soup.